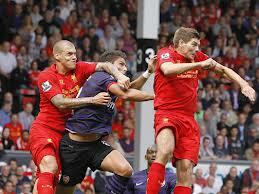 That’s more like it, what better way to get your first win of the season than winning comfortably at Anfield. This is definitely the tonic needed after the underwhelming feeling felt by gooners after Friday’s transfer deadline day. I’ll be the first to hold my hand up that I was not happy when no new reinforcements came in to strengthen the side especially a replacement for the loss of Alex Song to Barcelona. I still believe we missed an opportunity to snap up personnel at a reasonable price, when you see the likes of Clint Dempsey moving on for only £6m or Michael Essien going on loan to Madrid it does leave the feeling of missing out on good players when available. 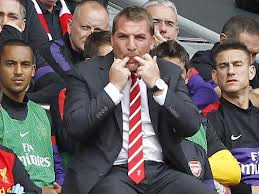 With the deadline day inactivity fresh in the mind a trip to Anfield had the possibility of being the banana skin that would incense the arsenal fans even more and heap extra pressure on Arsene Wenger and the team. It was paramount that we came away from the game with at least a point and luckily for us Arsene’s men wanted more than a point and made sure they left clutching all three. Now normally Liverpool away is a tough game, never mind the stats that we haven’t lost there for a while we have come away having to really earn our results in the past. They have never been easy games and we have had to ride our luck over the years to ensure we pull off the results. Yesterday I believe we came away with one of our most comfortable performances against Liverpool, don’t get me wrong it was not an easy game and they did cause us problems at times but in general we were in control of our destiny. I was waiting for the point in the game when Liverpool would step up the pressure and their overated world famous KOP would lift them as the twelfth man; im still waiting. Our fabulous away fans were in full voice throughout the game and it was only their voices I could hear singing throughout the game, of course this was aided by the team on the pitch as they provided the reasons to cheer. Going into the game we were still without our no.1 Szczesny so Vito Manonne had a chance to build on his clean sheet in the last game, Mertesacker was signalled out as the weak link to be exploited by the pace and trickery of Luis Suarez by the Sky Sports team and our new signings were still looking for their first goals for the club. It was nice to see Manonne put in an assured performance again, he did seem a bit uncomfortable with the physicality when the balls were looped in the air, but apart from that there were no complaints, he did everything that was required of him. Mertesacker who is often dismissed due to his lack of pace took the opportunity to show football requires more than just pace. His 80 plus caps for Germany are testament to the fact he has faced all types of strikers and coped, for Jamie Redknapp and co to predict a torrid game for the German was naïve. Our big German played his heart out, used all his experience to put in a fabulous performance despite an early booking for a pull on Suarez. He even managed to pull out a goal saving tackle with his telescopic leg to deny Sterling; the Liverpool fans screamed for a penalty but all replays showed Mertesacker pulled off a great tackle. In midfield we dominated the majority of the game, Abou Diaby was immense making the game look so easy for him at times, he made some great leggy runs reminiscent of Vieira in his Highbury days, an all round good performance which was a timely reminder to arsenal fans of what he can bring to the team when fit. Arteta was neat and tidy in distribution, tigerish in the tackle and seemed that little bit more determined in the game probably due to his Everton links; a great performance from the Spaniard protecting the defence. Now to Santi Cazorla our little pocket rocket, this guy is such a fabulous footballer whose stock is rising with each game he plays. Liverpool had no answer to his close control and vision, he really makes things happen when he’s on the ball and he provides the triple threat of being able to provide a key pass, able to shoot from distance with left or right foot and he has the skill to beat a man. The difficulty in defending against those three attributes led to the Spaniard laying on the opportunity in which Podolski scored to put us a goal up. It was important that our new signings made such a contribution to the team as Podolski showed his predatory skills to drill past Pepe Reina. Our German attacker did his bit in our win by playing an efficient game, he really helped out Keiran Gibbs on the defensive side and supported in attack. He was rewarded for his efforts with the first goal and also an assist when he played a slick one-two with Cazorla that ended with a howler from the keeper and the ball in the back of the net. The game ended 2-0 as we racked up another clean sheet, what a difference from 12 months ago. The defence is really playing for each other and apart from a few dodgy balls across the pitch from Jenkinson they were very switched on. Up front the jury is still out on Olivier Giroud, he was often isolated up front and he tried hard to battle for the balls played up front, his work rate is not in question but what he needs to ensure is he takes the chances that come his way. Much like the game on the opening day against Sunderland he found himself with an opportunity to slot home, this time on his favoured left foot but he somehow managed to not hit the target with his effort. I am very much behind our French striker and know he has goals in him but he needs that first goal for the club soon before it really affects his confidence. He doesn’t have the pace to speed away from the defender but he has the physical strength to work himself opportunities and his movement around the box is very good he just needs to score soon and banish any doubts about his finishing. Overall I am very proud of our boys for their performance yesterday, we’ve scored our first goals and now we can go into our next game against Southampton with confidence up. This is providing our players come through the international break unscathed (light a candle in prayer for Abou Diaby who was called up for France). One last point on the game, wasn’t it great to see Nuri Sahin struggle against our midfield yesterday? The Midfielder chose Liverpool ahead of us and to be honest showed nothing that we would have missed. In general Liverpool struggled trying to play us at our own game, you don’t learn tippy tappy overnight, those Liverpool players are used to direct long ball football and it was amusing to see them try playing triangles but just give the ball straight back to us after the third touch. They may get it eventually but for now the pass masters showed them why they are known for this football. 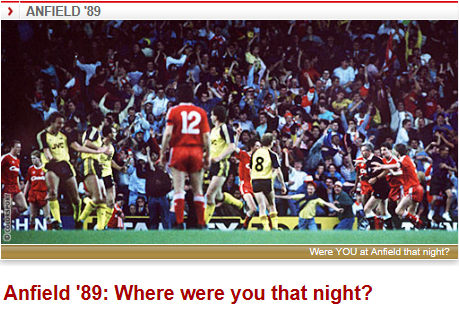 They invited Arsenal fans to recall their memories of that great night by emailing their recollections and a few were selected and published on the Arsenal.com site. I knew the names of a few players but didn’t ‘know’ the team inside out. On this particular night of the game I was in the local youth club (called lions boys club) and apart from the usual high jinks an 11 year old gets up to some of the bigger boys went upstairs to watch the game on the big tv. I followed and proceeded to watch the game with them. Fascinated by their conversations about who was rubbish who was great what a great pass that was my mind was like a sponge taking in everything. I particularly remember one of the older boys commenting on John Lukic’s stance and technique before kicking the ball out. The pressure the atmosphere everything about this game captivated me. I was really drawn in as a true football fan. Unfortunately my curfew was up and I had to go home. I so wanted to stay I so wanted to listen to the older boy conversations about Lukic Smith et al but i had to go. The intensity was so high I was half blocking out what she was saying. But then the moment came the move seemed to happen so quickly and in a flash Mickey Thomas was through on goal. Could this be it? Come on Thomas!! Yesss!!!! Goal!!! Mummy mummy! We did it! My screams must have disturbed the neighbours but I didn’t care arsenal did it. My Arsenal did it!! We were the champions. I love football I love Arsenal I love Michael Thomas I want to be an Arsenal player and score like that (steady). All be it I was at home in the living room with my mum when Michael Thomas scored. But I really can look back at it being one of the defining moments in making me an Arsenal fan. I had never been to a match I had probably never sat through 90 mins of an Arsenal game on tv. But that moment changed everything.